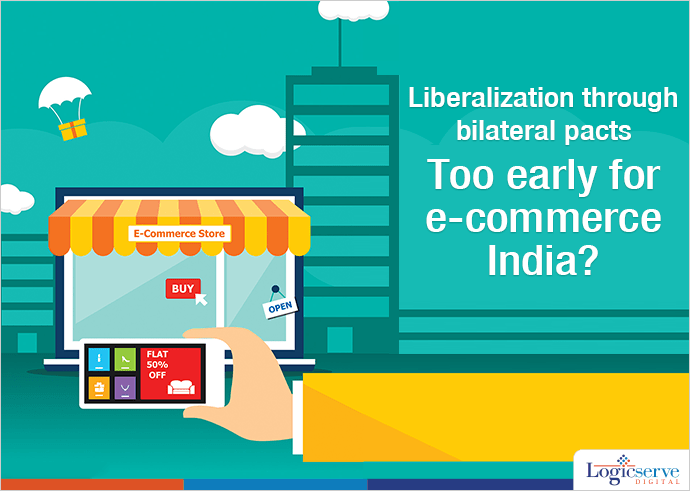 News: Liberalization Through Bilateral Pacts – Too Early for E-commerce India? The evolving ecommerce sector in India is already feeling daunted by the government’s initiative to sign up bilateral agreements with major trading partners especially under the purview of MFN status. Currently, India is said to be a strong supporter of Regional Comprehensive Economic Partnership (RECP) agreement for which talks are underway with 15 other countries. On similar lines, India and Singapore are all set to sign a new pact highlighting the ecommerce activities between both the countries under the aegis of the Comprehensive Economic Cooperation Agreement (CECA) without consulting the stakeholders involved. Currently, 100% FDI is permitted in B2B ecommerce business (wholesale) while FDI is not permitted in B2C ventures (retail trade). The domestic players have their apprehension about the ‘inventory model’ which leads to monopolistic competition with undue pressure on sellers to compromise on their profit margins. On the other hand, ecommerce players feel they offer a platform for B2B players to interact while their revenues come from data analytics, brand promotion, commission on sales, rentals and so on.